B-TR1-MD border tile is another beautiful borderline design in a diamond pattern, when working with our black strip tiles, black triangle mosaic tiles, going to create a stunning look to kitchen wall design. All is in details. Selling Point The unique triangle shape, matte finish. 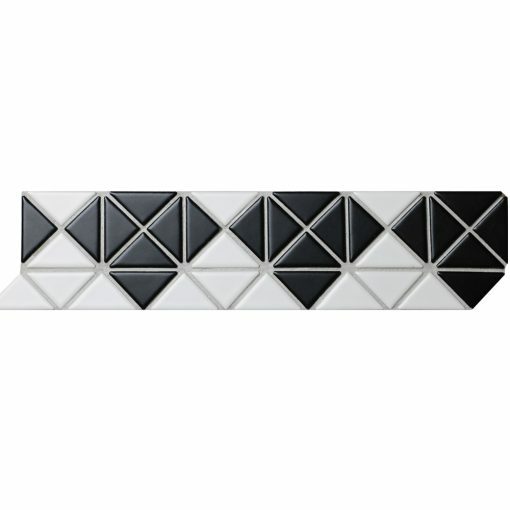 I’m interested in purchasing this diamond border for my entry-way, and love your idea to use the black strips to match, I’m also wondering what other your triangle tiles can work with it? I need to have sample to check them. Hello niki, most of our black and white triangle tiles 1″ and 2″ can fit this diamond border nice, you can buy one tile sheet from our website directly to check the quality. The border tile feels elegant in black and white, the diamond is so eye-catching! I placed a small order with this diamond pattern border tile, and the border for shower is BEAUTIFUL!! !